Luckyfinds: Treat the man of the house to a superb Steak Dinner this Father's Day! Treat the man of the house to a superb Steak Dinner this Father's Day! Last Friday, Meat & Livestock Australia (MLA) invited media to savor Australian Beef flavors in a 4-course menu prepared by Stella Wood Fired Bistro. Meat and Livestock Australia (MLA) is a producer-owned company which provides research for the Australian red meat and livestock industry and promotes beef, lamb and goatmeat in local and international markets. People around the world rave about the lean, juicy, and flavorful Australian meat gives. It is low-fat and dense with nutrients that is why Australian red meat proves superior among its counterparts. Meltique Austrailian Marbled Beef really makes a fantastic steak! It is soft, juicy, tender and flavorful even after cooking. Meltique Beef's perfect larding technique process to produce a “marbling” effect ensures that all of its natural juices are retained so that the full flavor of Australian beef is consistently delivered. It was definitely made with care and is suitable for all cooking styles! Now you get a chance to make sure daddy dearest gets a bellyful of his favorite Australian beef and more this Father's Day as MLA undertakes twin promotions for the month of June. 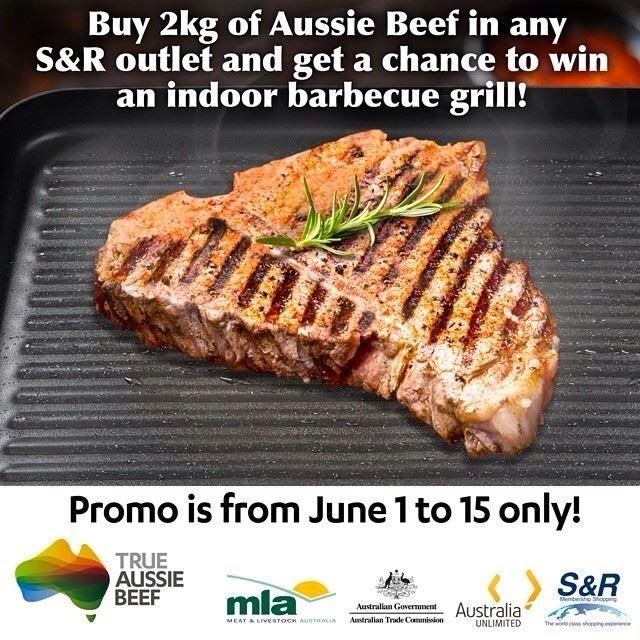 Every purchase of 2 kilos of Australian beef at any S&R branch until June 15 entitles customers to bring home any one of the following prizes: Indoor Grill, Charbroiled Grill, Apron Bag, Food Thong, Australian Red Wine or a Recipe Booklet. From June 14 to 30, diners at Cyma, Allium or Madison who will order any entree made with Australian beef also gets a special Father’s Day mug. Metlique steaks are "simulated" and "shaped" steaks using "meat glue" or transglutaminase. Generally safe as it's the same stuff used on fish balls, crab sticks, chicken nuggets, ham, spam, etc. But don't think that it's really a cut of beef. Know what you are buying. Nevertheless the stuff still tastes good anyway.